Who are On Campus Employers? Any UB faculty or staff that are looking to hire students to work in their department/office are considered on campus employers. Why Use Bullseye powered by Handshake? Register for the On Campus Job Fair in late August, and double your applicate pool for the fall semester. See a student you like? Contact students directly through Bullseye powered by Handshake. Need a quick start to your experiences? Access the how-to tutorials to find with videos and articles that will help you get started. Bullseye powered by Handshake is the ultimate job and internship tool to find the right candidate your department. But first, you'll need to create an On Campus Employer Account. Before starting the process of creating an On Campus Employer account in Bullseye powered by Handshake, please answer the following question. Have you ever taken a class at UB? 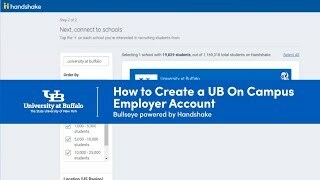 Since you've taken a class at UB, you may already have a live student/alumni account in Bullseye powered by Handshake. Follow these special instructions below on how to create and get access to an on campus employer account. This process works best when using Google Chrome browser. Go to the Bullseye powered by Handshake login page. Type your UB email under "For everyone else. Sign in with your email" and click the blue arrow button. 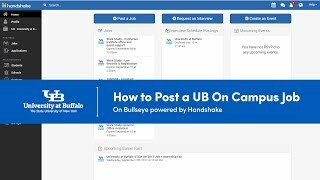 Click on Or log in using your Handshake credentials underneath the big University at Buffalo Sign On. Do not click on the "University at Buffalo Sign On." You'll need to reset and create a new password (see below) before being able to continue setting up your employer account. Click Forgot your password. ** This is so you can set up a Handshake password. Again, enter your UB email address then click Reset Password. Handshake will send you a Password Reset Request email. This may a few minutes to to show up in your inbox. Follow the email instructions and Reset My Password. Create a New Password that is a minimum of 12 characters long. This will be your Handshake password that you'll use to sign into Bullseye powered by Handshake. Then, close the Handshake tab or window in browser and continue to the instructions on how-to Setting Up Your Employer Account (below). Signing up as an Employer using your UB email address. Create a Handshake password. If you just reset your Handshake password, please use the same one here. Are you a UB Alum? A message will prompt you to enter the password for the Student account that's associated with your email address. Please re-enter your Handshake password that you just created and click the blue Sign Up button. Select the types of students you wish to recruit for your on campus position (select all that apply). Alma Mater and Graduation Year is OPTIONAL. Click the Next: Employer Guidelines button. Select NO to the question "Are you a third party recruiter recruiting on behalf of a company?" You'll receive an Email Confirmation email from Handshake. This may a few minutes to show up in your inbox. Once you receive your Email Confirmation, continue to Completing Your Employer Profile (below). In the email, click the Confirm Email button. This will bring you back into Bullseye powered by Handshake. Next, search and Request to join UB - University at Buffalo, The State University of New York as your company/employer. You'll receive an access request to UB - University at Buffalo, The State University of New York stating that you've successfully requested access to UB. An alert has been sent to staff members in Career Services. You'll receive an email that you're approved within 2 business days. Click the Next: Connect to Schools button at the top of the page. Using the search bar, search for University at Buffalo. Click the + next to the University at Buffalo to connect to the school. This allows students to see your posted jobs or internships. Click the Next: Finish button at the top of the page. Please wait for a request for access to UB - University at Buffalo, The State University of New York has been approved. An email will be sent your inbox from Handshake. Once you receive Your access request to UB - University at Buffalo, The State University of New York has been approved email, continue to Posting Your On Campus Jobs and Internships (below). You’ll receive a message whether you are approved or pending. You must be approved before being able to post a job or internship. This may take up to 2 business days to get approved. Login to Bullseye powered by Handshake. Type in your Handshake password and click the Log In button. Start posting your on campus jobs or internships! Post jobs, internships and view resumes to get the right candidate for your department, all in Bullseye powered by Handshake. Never logged in as an employer before? Follow our step-by-step guide on how-to create an on campus employer account. 1. Login to Bullseye powered by Handshake as an Employer. 2. Click on Post a Job on your home page dashboard. 3. Begin to fill out all four (4) sections of the form, clicking NEXT in between each section. *See tips below to help you maximize your job/internship posting. Please start the Job Title with the type of position you’ll be posting and the office/department. Examples: Student Assistant – Career Services Front Desk Assistant. Work Study - Career Services Skillshop Assistant. Graduate Assistant - Career Services Career Assistant. **Hint: this helps students filter and discover jobs they are qualified for and know which office/department they are applying to. "Company Division" is your office/department. For Job Type, select ON CAMPUS STUDENT EMPLOYMENT. No need to change Job Location. Please keep as 12 Capen Hall, Buffalo, New York 14260-1660. Select only the majors that can apply to your job. **Hint: all desired majors should be in green. To unselect a major, click the check mark next to the major and it will turn gray. Choose how you want to receive applications. Add only University at Buffalo to your school list by clicking UNIVERSITY AT BUFFALO. 4. Once you have completed filling out your job posting, click CREATE. 5. Next, add the NACE Career Readiness Competency label(s) to the posting. You can do this by clicking the “Select a label” down arrow located on the right side of screen. Select all the NACE Career Readiness Competencies that apply to this position. 6. Finish by reviewing job/internship posting to make sure everything is correct. Want to check out you posting? Easy! Login to Bullseye powered by Handshake as an Employer. Click on Jobs in the left hand navigation. Click on "Edit this" at the top of the page next to "viewing all UB - University at Buffalo, The State University of New York jobs" to view Jobs created by me. Login using your email and Handshake password. Not the "University at Buffalo Sign On." Get started: View Instructions or Watch Video. Good News! You already have a live student/alumni account in Bullseye powered by Handshake. Follow these special instructions on how to create and get access to an on campus employer account. Need Help: Problems Creating an On Campus Employer Account, Posting a Job or Internship, or Managing Applicants? This video will help you set up an on campus employer account. This video will help you post an on campus job. This tutorial will help you manage from start to finish the applicants that apply to your posting.